So you decide it’s time for you to buy a round baler. Maybe you’ve had an older one, maybe you’ve been hiring it done, or maybe your switching from square bales to save on labor. For many the cost of a new round baler is not in the budget, so you decide to look for a good used round baler. It can be overwhelming, with many magazines and websites loaded with used round balers. Read on to learn about the used round baler market and how to navigate through the junk to find one that will suit your needs for many years. Before anything make sure to set your budget, and stick to it. Write down what your budget is so you can be reminded of it when looking at balers. Its common for people to start wanting more and getting way out of budget. If you have a spouse or significant other, they can be a great way to remind you of your budget. First thing you need to do is make a list of what you need in a round baler. What kind of chamber, fixed or variable, endless belts or laced, size of bales, e.t.c. You also need to determine how much horsepower your tractor is, and also the size/weight of it so you can look for a baler that you can safely pull. Also what other feartures you want, such as precutter knives, silage package, bale ramp, e.t.c. Then you can decide what brand or brands of baler you are interested in, and you can even narrow it down to specific models. Once you determine what you need in a baler, and what kind of baler you are looking for, it’s time to start your search. There are many places to start searching for your next baler. First, check around your local dealer yards, not only is this good for looking at balers, but also a great way to see what dealers have the best parts and service departments. If you have a specific dealer that you deal with a lot, and they treat you well, than I advise starting there. Also talk to the salesman, (their not all bad), as many times just because they don’t have something on the lot that interests you, they usually have many connections around the country and can find you something that fits your needs. Tractorhouse and Fastline magazines are great to browse through and also have good websites that make it easy to look at balers that fit you. I suggest avoiding sites such as craigslist, not because there may not be some good balers on there, but most are generally on there for a good reason. Once you find a baler you are interested in, its time to go look at it more in depth. If you have a friend that has worked on farm machinery, try to take them with you, even if you don’t an extra set of eyes is always a smart idea. Check the baler thouroghly and make sure you get to see it run. Check the belts, chains, and pto shaft for wear and signs of abuse. If possible, ask the dealer to let you try it out in the field. If the dealer lets you use it for a few days, this not only is good to check the baler out, but also is a good sign of a dealer that is going to stand by their product. After you find a baler you want, thats in your budget, and passes your inspection, you can now purchase it. After purchasing a used piece of machinery, its always best to change any fluids that need changing and lubricate it up well. If you need help in your search for a new used round baler, contact us (https://www.theroundbaler.com/contact-us) we will be more than happy to help you! Also be sure to subcribe to our newsletter, to stay up to date on theindustry and learn how to get the most out of your baler. Self Propelled Balers: The Next Big Thing? With Vermeer's new innovation, the ZR5, the world's first self propelled round baler, we find ourselves wondering, will self propelled round balers be the next big thing? Just take a look at how the combine evolved, from stationary threshers, to pull behind units with mounted motors, to the large behemoths that roam the countryside today. Will round balers follow the same path as combines? Or will the self propelled round baler only be a fad and be a collectable in 50 years? We will look at it from all angles. Combines also started out as pull behind units, but when manufacturers started making self propelled units, they caught on quick, and now no manufacturer makes a pull-behind unit and haven’t for decades now. Combines have such a important job on the farm, it only makes sense that they are a dedicated machine, with their own engines and drivetrains. But many hay farmers use their tractors for multiple purposes throughout the seasons, especially livestock producers. It wouldn’t make sense for a lot of them to have a dedicated machine for round baling, when they could have another tractor that could be used on multiple implements. Also if the tractor breaks down you can put another tractor on the baler, that is not the case with a self propelled round baler. Although the ZR5 is the first self propelled round baler it is not the first self propelled baler. New Holland made a self propelled version of their small square baler many years ago, although there are still many in use today, it never caught on and New Holland decided to seize production. There is also a lesser known company called Freeman, that continues to make Self Propelled square balers, although I have never seen one here in the U.S. These self propelled square balers never caught on, mostly due to the fact that they didn’t have much to offer that a regular pull behind baler couldn’t. But round balers are different. Better maneuverability and visibility in the field could give self propelled round balers the boost they need to gaintraction in the marketplace. There is no word on price yet, but if it is comparable to the price of a new round baler and compatible tractor, then it may make perfect sense for larger producers and custom operators. But farmers are a hard group to convince and until they start hitting the local fields and dealer lots, it is nothing but a crazy idea to the average farmer. And like most crazy ideas it will take time and evidence to prove to farmers that self propelled balers are superior to their pull-behind counterparts. I believe the fate of self propelled round balers lies heavily on Vermeer. If they bring out a machine that is nothing but headaches then that will leave a permanent stain on the industry, and will remain in farmers minds for many years to come. On the other hand if the ZR5 is a dependable machine and starts to catch on, it wouldn’t be long before other manufacturers followed suit. Only time will tell, but I think if the ZR5 is a solid machine they will become common place on larger operations but I don’t see them coming to small farms for a while. What do you think? Will the self propelled round baler catch on? Would you own one? Tell us what you think, leave a comment below! The large belts that form the bale in your round baler are essential in making a good bale. When your belts get worn they tend to break more often and make lighter bales. When your belts start to wander more than normal it may be time to place them. You may also notice odd shaped or lighter bales. If you have laced belts they may also start coming apart quite often. It is essential to know when and how to replace your belts when the time comes. Normally belts will last anywhere from 5,000 to 25,000 bales, and more is not unheard of. There are a lot of factors that contribute to life of your belts, the age of your baler, maintenance, the operator, type of baler, e.t.c. Endless belts will generally last longer then laced belts, as they don’t have a connection, which is often the place where a belt will rip. Although they last longer, endless belts are much harder to replace. They require disassembling the machine to install them, whereas laced belts can easily be replaced on the home with two people in a couple hours or less. That being said you can always replace endless belts with laced belts when the time comes, all you have to do is cut the old belts and place the new belts in their place and lace them together. When you replace laced belts, or repair broken belts, the best way to do it is with new clips. If you use a vise, it is easy to replace the clips on your belts. Just do a quick google search for kits and you’ll find an easy to use kit, and I recommend anybody who owns a round baler to own one, as they come in handy on a Sunday with hay on the ground and rain in the forecast. Whatever kind of baler you own, if it has belts, you will eventually need to replace them. Belt’s, like anything rubber, is prone to premature wear. It’s always best to have a spare just in case. If you have any questions about replacing the belts on your baler, contact us, we’ll be glad to give you advice, free advice of course. On July 19th a tornado formed near Pella,Iowa and ripped through the Vermeer Corp. factory and business center. It was a miracle no one was hurt. The employees at Vermeer have come together,like a family, and have started the process of rebuilding. Vermeer, founded in 1948 by Gary Vermeer, is a leader in the hay industry, and pioneers of the modern round baler. Vermeer is also the largest employer in the Pella, Iowa area with approximately 2,800 employees according to the Des MoinsRegister. Vermeer has been shuffling around trying to keep production going through this difficult time. They are currently back to 100% production and are in the process of rebuilding after two of their buildings were deemed complete losses and need to be torn down. They have received much support by the community and their customers as they have remained positive. Not only are they planning to rebuild, they are also planning to expand production. They are currently in the planning phase and plan to complete the project next year (2019). We are very glad no one was hurt in the storm and believe Vermeer will take this as an opportunity to improve even further upon their company and their employees. After you have baled your hay, you have another task at hand, how to get the hay home. Every person you talk to will have different advice, and different ideas. Some people like to use a tractor with a front and rear spear and do two at a time while others will use a tractor trailer with a flat bed and do 40 at a shot. Depending on your location, budget, land and distance from field to storage area you will have to decide what's best for you. One of the simplest ways to haul bales home is with a spear on the loader and a spear on the 3 point hitch. You generally never have to leave the tractor and don’t have to worry about more equipment to buy or take care of. This is a time consuming process and unless your putting the bales on the edge of the field, it isn't very practical. The most common way to haul round bales is with a round bale wagon, or a flatbed wagon (some people convert old square bale wagons to use for round bales). If your fields are within a couple miles you can easily use the same tractor to load, haul and unload, which is very common for people who do it by themselves. This is a good option if you have a good loader tractor that can travel at decent speeds on the road. You can find wagons that will fit anywhere from 6-40 bales at a time, and if you have a large enough tractor you can hook two together to make half as many trips. Some people will also use a tractor or skid steer to load and another one to load, then use their pickups to haul the wagons, which can be much quicker on the road. You can also find wagons that are self-unloading. Another option is a round bale accumulator. These can be expensive and are not practical for smaller producers. They are self loading and unloading eliminating the need for a loader. They are very efficient and some of them even stack the bales if you are stacking in a barn. They generally require a larger tractor (120hp+). If you are moving a lot of round bales they are definitely worth looking into as they can be big labor savers. Some people prefer to use gooseneck or bumper pull trailers pulled by their pickup and load/unload them with loader tractors and skid steers. This is a good way to haul from those farther away fields. They are quick on the roads but can be a pain in wet fields. They also have to be strapped down which takes time,and if the fields are close can be not time efficient. Another thing to remember is that a gooseneck trailer can be used for many other purposes than just round bales,like buying another tractor. Every farm is different and depending on your fields, roads and time you will have to decide which option is best for you. Many times people will try different methods till they find the one that suits them best. Sometimes you can also work with your neighbors to share equipment which can be a smart move for both of you, but be sure to know who your dealing with before getting involved in this. One of the original sellers for round bales was the fact they could shed water. Round bales were often times left in the field till they were needed. As round balers evolved, so did the way they were stored. The most common way of storage today is outside in rows, preserving the hay on the ends of the bales but still losing hay on the outer edge. Net wrap has made this a more viable option as it protects more of the hay than twine wrapped bales. It is essential when storing the bales in rows, to leave space, enough to walk, between the rows to prevent molding. It is also important to make sure the bales are dry enough so they don’t heat up, which will ruin the hay. Some people choose to store their bales outside under a tarp. They are generally stacked three high in a pyramid shape, and a tarp placed covering over the stack. Make sure to use a good tarp with no holes and to secure it down properly. If the tarp rips or comes off you may end up with a messy pile of hay. This option can be difficult for areas that experience high winds, as the tarps will get ripped apart in no time. Another way to store round bales is inside a barn. This is the best option for dry hay as it preserves the most hay, although many people do not have room for round bales, as they can take up quite a bit of room. Most people place pallets, or something similar, underneath the bales to prevent molding at the surface, and allow the hay to breathe. It is best to place the hay facing upward as high as you can, generally two or three bales high in most pole barns, than if needed you can place another row on top facing outward. Make sure you have the proper equipment to stack the bales, as many smaller tractors can be dangerous to stack hay this high. Balage has become an increasingly popular option over the past couple of decades and rows and stacks of white marshmallow looking bales can be seen all over the countryside. Balage bales,similar to haylage, are baled with a higher moisture content and then wrapped shortly after with plastic. There are two more popular types of wrappers, inline and individual. Inline wrappers are known for their speed, as they wrap bales end to end in a row, which is nice for dairy farms but can be difficult for smaller farms as the bales will mold if not used quick enough. Inline wrappers can wrap the bales in the field one at a time, much slower than inlines, they can then be stacked with the help of a bale hugger and can be fed individually without issues of molding. Another option is to wrap dry hay. The hay is wrapped in the same manner, but you have to make sure the hay is dry enough, usually it is best to let it sweat out by letting it sit for a week or so, or anyways the hay could mold inside the wrap. 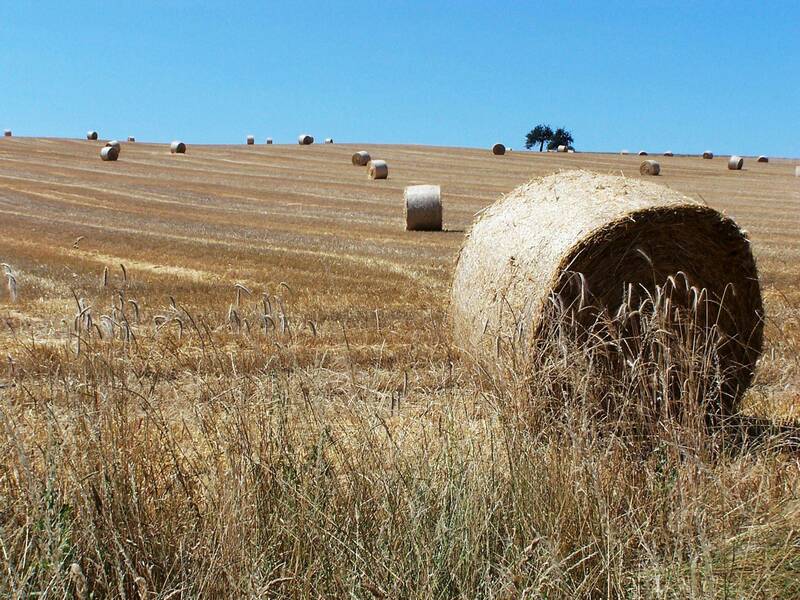 However you store your hay the key is to bale it at the right moisture content, and to make properly shaped bales. Many farmers now use a combination of these options depending on the different qualities of their hay. Always keep safety in mind especially when stacking bales above your head.